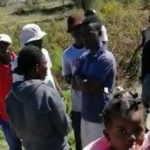 A CROWD of onlookers gathered at the house of a man suspected in a series of house breaking and theft incidents in the Goreangab informal settlement when police arrived to arrest him. The suspect, whose name cannot be revealed until he appears in court, allegedly stole items from a bar near his house during Sunday night. Some of the stolen items like phones, money and bottles of alcohol were recovered from his shack. One of the suspect’s neighbours, Veronica Haixwema, said that the man has been living in that area for approximately two years now. “This is not the first time that something like this happens. He has been in and out of jail. The last time, we still found our items in his shack. We live in fear because he continues to stay here among all of us,” Haixwema said.